Emmet Otter, second from the right, with his Jug-Band. Before the days of YouTube and Google, when one could still fall deeply in love with a piece of pop culture and then lose it in the ether, I was haunted by a small Muppet otter. His name was Emmet. It was the 1980s but he dressed like a millennial lumbersexual. He had worried eyes, a nose like a terrier’s, and a bluegrass band. I do remember describing the whole thing to my mother somewhat desperately, begging her to find it for me again. There were little otters in knitted caps, a mother otter in a canoe, bands in a talent show, and a washboard (though I didn’t really know what that was). She vaguely remembered watching the program on television with me, but these were like no Muppets we knew. And none of the other kids I asked knew about Emmet, either. Every Christmas, I’d click around the television, scanning for him, to no avail: just Snoopy and Claymation reindeers. Did I dream him? Why yes, I do still own this VHS tape. Years later, probably when I was in middle school, I was standing in line at Blockbuster Video. There, on the carousel of priced-down VHS tapes for purchase was a Jim Henson Muppet movie: Emmet Otter’s Jug-Band Christmas. It was real! I grabbed it. I have no idea how much I paid–probably about eight bucks—but whatever the cost, it was a steal. I would never lose Emmet Otter again. And he didn’t disappoint. He was as adorable as I remembered, and with a few more years behind me, I could understand the movie’s storyline: a sort of Gift of the Magi adaptation starring Emmet, a poverty-stricken but optimistic young river-dweller and his sweet Ma, Alice Otter, who does washing for all the creatures of Frog Hollow. Emmet helps support the family doing odd jobs, but what he and his Ma really love is music. When a Christmas Eve talent competition with a $50 prize is announced, a series of events are set into motion. The climax is a battle of the bands in which Emmet and his honkytonk crew are challenged by the Riverbottom Nightmare Band, some hard-rockers led by a denim-vested bear named Chuck. I won’t tell you what happens. Kermit the Frog introduces the story, pedaling his bicycle into Frog Hollow, plaid scarf looped around his neck, but then largely disappears, save for a little narration. There is no Miss Piggy, no Fozzie Bear, no Gonzo. Instead, the old-timey storybook universe of Frog Hollow is populated with a more naturalistic cast of foxes, weasels, possums, and muskrats, cloaked in layers of faded floral prints and scratchy flannels. Wendell the porcupine’s quills stuck through the back of his cardigan. I suspect Wes Anderson may have been a fan. The New York Times loved it (pdf), though noted that strings could be seen guiding the motions of marionettes in one or two scenes. It may have looked like my stuffed animals had come to life, but according to the vast resources that are the Muppet Wiki and Jim Henson’s Red Book (if only I’d had the internet as an Emmet-seeking child), the 50-minute special was groundbreaking for Henson’s team, and paved the way for more ambitious Muppet feature films to come. Taped in 1977 and aired on US and Canadian TV, Emmet Otter included traditional hand-puppetry, marionettes, and pioneering radio-controlled animatronics. It preceded the Muppet movie, and without those otters we may never have had the fantastic creatures of Labyrinth. Those sets (A 55-foot river with a radio-controlled rowboat!) and expressive puppets represented a great deal of experimentation—both technical and artistic—for Henson’s team. (And if YouTube outtakes are any indication, they were also having a lot of fun.) With a timeless story, what they created was a truly modern achievement—however analog it may appear in retrospect. Despite some truly catchy songs, rave reviews, and four 1981 Emmy nominations, the movie has since fallen into obscurity, perhaps overshadowed by the Muppet feature films to follow. While you can now watch Emmet Otter’s Jug-Band Christmas on Amazon Prime, it will be just a little bit different from the original. Kermit’s original narration had to be eliminated after Disney bought the rights to his character. 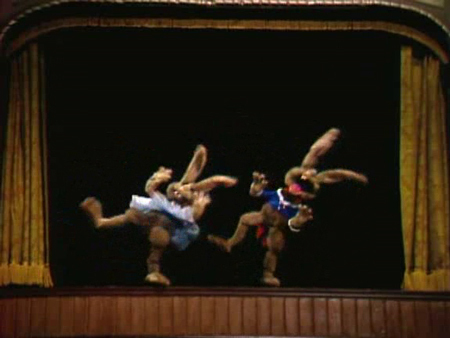 And a scene of erratically dancing rabbits at the talent show has also, tragically and inexplicably, been removed. But the charming story, with all its visible strings, remains. Emmet may not have achieved the fame or fortune of Kermit, Piggy, or David Bowie the Goblin King, but that sweet little otter remains, forever and always, my favorite Muppet. I’m so glad I found him again.